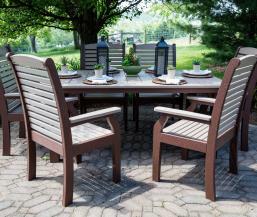 Are you looking for durable outdoor furnishings with the quality and styling of indoor furniture? The Classic Terrace collection by Berlin Gardens is sure to meet your requirements! Every piece in the Classic Terrace collection is available in your choice of colors and fabrics to suit any style and manufactured in the highest grade of poly lumber. Your choice of sofas, loveseats, chairs, rockers, ottomans and tables.